Mystic Dawn has an enchanting, mystical atmosphere. It’s a very textural, multi layered composition with an organic, dreamy vibe. It's very comforting. Very nurturing. When played in the background, it spreads a soothing warm atmosphere throughout any space. When listened to with headphones this music makes deep relaxation and peaceful meditative states effortless. This palette of sounds works really well together to release the mind from analytical thinking and has a very calming effect. 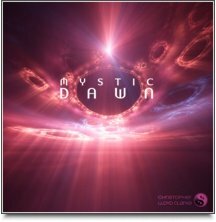 Although there are no emotional highs or lows to be found in Mystic Dawn, the music repeatedly cycles through progressions that gently build and release, conveying a sense of occasion and even inducing feelings of euphoria from time to time. My intuitive sense is that this music could also be quite effective as a natural pain reliever. It seems to have a softening effect on the nervous system. It is quite nurturing. This is music that you can retreat into – the kind of music that starts to feel like “home” the more you listen to it.